Before it was transformed into a truly luxury development containing a residents-only lounge that opens directly onto one of London’s largest private roof gardens, South Bank Tower was the headquarters of IPC Media. IPC was one of Europe’s largest publishing companies and its titles included the best-selling science fiction comic 200AD. For those unfamiliar with sci-fi or British comics, 200AD’s fictional editor was Tharg the Mighty – a green-skinned character from Quaxxan whose favourite food was polystyrene cups. The comic’s human writers and editor depicted King’s Reach Tower (as the building was previously known) as the nerve centre of its alien editor Tharg. As a result of him appearing in almost every issue of 200AD, along with Judge Dredd, Tharg spent a total of 30 years in what is now South Bank Tower. Back to the future and when complete at the end of this year, South Bank Tower will provide its residents with a multitude of luxury facilities. These include private dining facilities, a business suite, a private gym and fully fitted exercise room, a 20m swimming pool, sauna and steam room accessed via the secure residential lobby that has been designed by award-winning architects KPF, a 24-hour concierge and porter service plus 360-degree views of London. A limited number of secure car parking spaces will be available in the basement, which will be allocated to selected apartments. The mixed-use development of 191 luxury apartments rises 41 storeys above the Thames and also includes 220,000 sq ft of office space and a 10,000 sq ft supermarket within the 36,000 sq ft of retail space. Inspired by the skyline, every room in every apartment has windows that stretch from floor to ceiling, which maximise the views of the City of London to the north, St Paul’s Cathedral and Tower Bridge to the east, Battersea Power Station to the south and the London Eye and the Houses of Parliament to the west. In the quest to create contemporary luxury at its very best, the interiors of the apartments at South Bank Tower – which range from 414 sq ft studios to 2140 sq ft three-bed penthouses – combine pure design and quiet elegance. And no expense has been spared on the finish. Materials used include oiled timber floors, lacquered kitchen finishes and porcelain tiles in the well-equipped bathrooms. South Bank Tower’s enviable location on the banks of the Thames means that London’s highlights both north and south of the river are just a short walk away. These include the music and arts scene of the Southbank Centre, the gastronomic temptations of Borough Market, the retail delights of Covent Garden and the internationally respected financial institutions of the City of London. No less than six of Europe’s top 40 universities – Imperial, UCL, King’s College, LSE, Royal Holloway and Queen Mary – are just a stone’s throw away, making the South Bank ideal for those seeking world-class academic facilities. 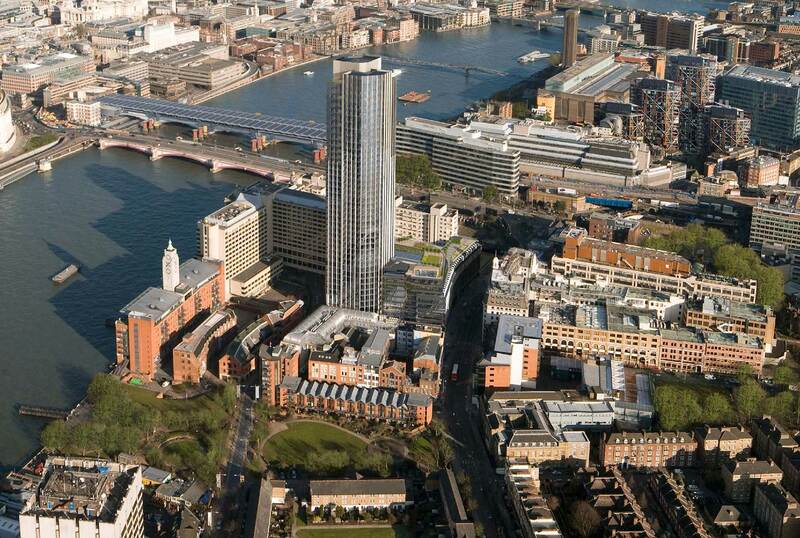 South Bank Tower is also close to the key transport links of Waterloo, London Bridge and Blackfriars stations, so travelling further afield is equally easy. South Bank Tower redefines high-rise living through a blend of architecture and interior design, reflecting the unique artistic heritage of this cosmopolitan area of London. For more information about securing a unit in this breathtaking development, contact Garton Jones by calling us on or filling in the form above. We promise all signs of alien life and polystyrene cups have been replaced by an out-of-this-world London residence.